Momentum represents the mainstream of politics, its chair has said, as he predicted Britain could be “months” away from a Jeremy Corbyn government. Jon Lansman, founding chair of the pro-Corbyn group, said Momentum represented the “new mainstream” as he hailed what he described as a new-found acceptance of the party leader among Labour MPs. 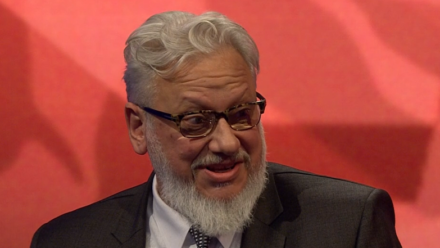 In a bullish interview with BBC Newsnight, Lansman also repeated his vow to root out anti-Semitism in politics. The veteran Bennite was last week elected by a wide margin – along with the other two candidates on the left slate – to Labour’s national executive committee. Last night Lansman said it was possible Theresa May’s government could fall and prompt a fresh general election. “We could be only months away from a Corbyn government,” he said. Lansman was also pressed on the controversy at Haringey council in north London, where several sitting Labour councillors have quit or been deselected following a row with Momentum activists over a local regeneration scheme. The Labour group is expected to remain in office after the local elections but with a majority of councillors backed by the Corbyn supporters, making it the first “Momentum council” in the country. When asked what “big ideas” Momentum had for Haringey, Lansman responded: “Am I the radical man? I think I am the mainstream man. Momentum is the new mainstream”. Labour has shifted decisively to reflect Momentum’s ideas, he added.